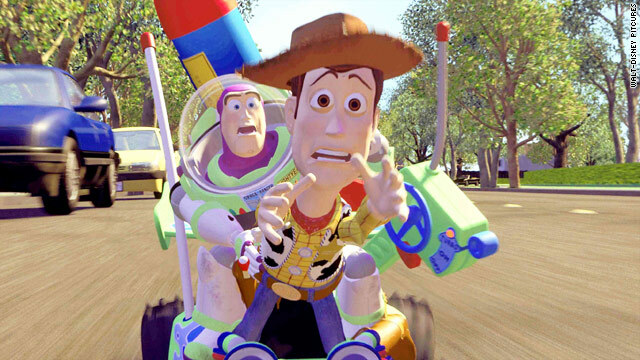 In "Toy Story 3," Woody and Buzz Lightyear leave Andy's house for Sunnyside Daycare. (CNN) -- How should a tortilla move? Trust Pixar to ask the important questions and to come up with the most inspired answers, too. Unsteadily, at first, in a floppy, folding, undulating furl, on detachable legs accustomed to the rotund corporeal bulk of Mr. Potato Head (the potato being indisposed at the time). Nobody speaks body language more eloquently than Pixar. In another inspired touch, space ranger toy Buzz Lightyear is inadvertently rebooted for the Hispanic market. Not only does he switch to fluent Spanish, he accompanies his newly ardent protestations of love to cowgirl Jessie with flamboyant flamenco finger clicks and swiveling hips. He's an intergalactic toreador of love. But in any case, conventional wisdom never seems to apply to Pixar, the digital animation giant that only ever seems to produce winners: "WALL-E," "Cars," "Up" and "Monsters, Inc." to name just a few. It was "Toy Story" that started Pixar's remarkable run 15 years ago, but the angsty devotion of Andy's cowboy doll and his friends (a slinky dog, a cowardly T Rex and a piggy bank named Hamm among them) as they await their inevitable retirement remains as poignant today as it did then. Maybe more so, now that a generation of kids have grown up with these characters, and, in some cases, probably have grown out of them. iReport: Kids review "Toy Story 3"
In "Toy Story 3", Woody and Buzz (voiced by Tom Hanks and Tim Allen, as always) remain unchanged, as good as new in fact, but their owner, Andy, is 17 now and moving on to college. His mom wants his room cleared, and a misunderstanding consigns the toys to Sunnyside Daycare. Initially the idea of all-day play seems too good to be true, but Sunnyside has a dark side: it's "a place of ruin and despair", a pre-kindie pastel-colored gulag presided over by Lotso (Ned Beatty), an avuncular pink teddy bear who smells of strawberries (so we're told, the movie is discreetly 3D but not in smell-o-vision). It's at this point that a slow-starting story hits its stride. Loveable, huggable Lotso makes a terrifically malignant bad guy, a tin-pot dictator whose loathsome lackeys include a baby with a beady eye and a head capable of 360 degree rotations right out of "The Exorcist"; a scary cymbal monkey who doubles as an alarm system; and -- yuck -- a Ken doll. Lotso's wicked plan? To confine the new guys to the toddler room, a charnel house of free play just a short hop from the landfill. A great escape movie, "Toy Story 3" funnels the series' abiding separation anxiety into a succession of ingenious feints and evasions, climaxing in an apocalyptic vision of the gaping inferno. Thrilling enough to goose smaller kids, the film is more likely to give sleepless nights to their parents. After all, it's the older folk who are left behind, like Woody, when the kids head off to college. So now you're abandoned and redundant, wondering whether it's OK to go see the latest Pixar without a youngster in hand. Yes, it's OK; you owe it to yourself.